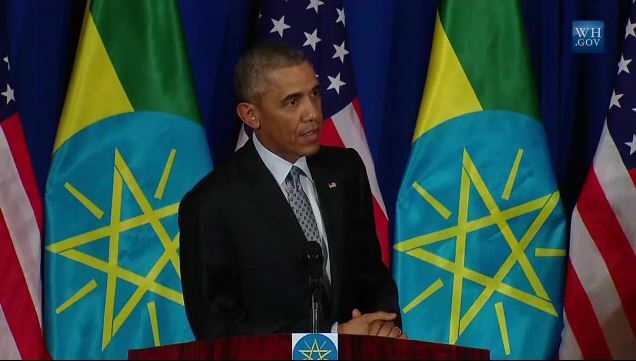 President Obama’s visit to Ethiopia was criticized from all corners of the world including human rights organizations such as Amnesty International, Human Rights Watch, Freedom House, think tanks, scholars, lawyers, etc. The assortment of the displeased with President Obama reminds one of the international uproar President Bush the son caused before invading Iraq in 2003. President Bush ignored the warning of the rest of the world with the exception of few nations and we see the result in the current turmoil that has engulfed Iraq, Syria and the Middle East in general. At that time, President Obama was not only opposed to the invasion, once he became president, he didn’t spare time to start disengaging the US military from Iraq. So what is the explanation why the same person who vehemently opposed the Iraqi invasion with the rest of the world has stopped listening to the same rational voices when it comes to the dictators in Africa especially of Ethiopia? The most obvious and widely held explanation is that the Obama administration has conveniently abdicated particularly its Ethiopian policy to the very personal whims of the likes of Susan Rice, Wendy Sherman, and Gayle Smith who has a long history of working with TPLF going back to 1982. We know in 2009, President Obama was chosen for the Nobel Prize for Peace, not because he brought peace between two warring nations like President Carter did between Israel and Egypt; or not because he was the leader of a nonviolent civil rights movement like Martin Luther King was; and not either because he fed the poor as Mother Theresa of Calcutta did, it was only because the speeches he made in Cairo and Berlin while he was still on the presidential campaign trail fired up the hopes of the young and the old, the oppressed and the voiceless across gender and color and national boundaries. The world was so horrified, depressed and hurt and felt so disrespected during the previous eight years of the Bush II era, the Nobel Committee apparently hoped the young Obama hailing from an African father and an Irish mother would be nothing but a redeemer and rectifier as the leader of the Free World. The Nobel Committee didn’t choose Obama from among other eligible candidates just to make a statement directed at Bush II and his supporters for arrogantly defying world opinion with their obsession that might is right and that is all that matters. Unfortunately, the sad truth is that there is a huge gap between what President Obama preached in his famous and well received speeches and what he has accomplished for the oppressed and the voiceless warranting that the Nobel Committee ought to be regretting its premature decision. For quite a while human rights organizations have been pointing fingers at the Obama Administration for ignoring human rights violations in countries such as Ethiopia where such violations are the rules not the exceptions, and for playing the role of an enabler. All along, the Administration has been denying the allegations. However, on August 1, 2015, the Administration came out of its closet when the President visited Ethiopia defying world opinion, and in glaring daylight with PM Hailemariam at his side, gave his blessings to the TPLF tyrants as democratically elected. That day, President Obama didn’t have to go too far to find out that Ethiopia was anything but a democracy. The proof was staring at him. Only one Ethiopian journalist was allowed to ask a question, and the only question the cadre journalist cared to ask the President was about Ginbot 7’s recent movement in Eritrea. Yes, the President did say something better the next day at the African Union Hall when he lashed out at African despots, but rest assured his warnings were not meant to include the TPLF leaders that he anointed the day before as democratically elected. Needless to say that the President’s lack of consistency ought to be as worrisome and unsettling as his glorification of the ethnocentric and totalitarian regime. In one of his speeches the President even implied that democracy needs to be tailored to fit the prevailing conditions in a society. This begs the question if the President is buying into or blessing the developmental state approach which is in total contradiction with the principles this great nation of USA is founded on – freedom of speech, freedom of assembly, freedom of press, and freedom of religion as God given and inalienable. President Obama, did not also hide his surprise at being criticized for visiting a smaller country like Ethiopia but doesn’t hear any such criticisms when he visits a bigger country such as China. The President, without a doubt, missed the point that China never claimed itself a democracy. Whereas the TPLF dictators do unabashedly claim they have a democratic system in place, a claim unfortunately endorsed by the President while the rest of the world begs to differ. Despite China’s huge involvement in the Ethiopian economy and its blind support for the TPLF regime, it never crossed Diaspora’s mind to protest in front of the Chinese Embassy anywhere in the world for the simple reason that China could care less. For a man who gave so much hope to the oppressed and the voiceless only to disappoint them by siding with dictators, for them, Mr. Obama is a Trojan horse, and will remain so unless he proves himself otherwise in his remaining time. How could one then explain why President Obama, during his visit to Ethiopia, did not say a word about the Ethiopian Muslim Community leaders who on July 5, 2015, were convicted of trumped up terrorism related charges, and the deteriorating Ethiopian Muslims situation in general? When Secretary Kerry visited Addis Ababa last year, in his press conference, he did not utter a word either about the Ethiopian Muslims issues that was about three years old at that time. However, Secretary Kerry did not waste time to express his grave concern about the recently arrested Zone 9 Bloggers. Several months ago, Dr. Tedros Adhanom, TPLF’s Foreign Minister, in an interview with a pro-TPLF radio station in the Washington, DC area stated that the jailed Ethiopian Muslim leaders had some sort of liaison with some of the Guantanamo inmates. Both the State Department and the White house kept quiet regarding the Foreign Minister’s outlandish statement. Hence, it should not be farfetched to entertain the idea that the Obama Administration doesn’t have problem with the accusations leveled at the Ethiopian Muslim Leaders as “terrorists” and their subsequent convictions on the trumped up charges. It is also justified, at this point, to conclude that the Obama Administration is contented with the efforts of the Ethiopian government to forcefully impose the Ahbashi ideology on the Ethiopian Muslim community, and it is quite eagerly waiting to see the outcome of the experiment at the expense of the peace loving Ethiopian Muslims. In 2008 and 2012, during President Obama’s campaign for the White House, thousands of Ethiopian-Americans all over the United States were soliciting votes for him knocking on doors from sunrise to sunset. When the President visited Ethiopia and declared it a democracy, the expectation of the loyal Ethiopian-American constituency was shattered and the feeling among them can be summed up with what Shakespeare’s King Lear said “… how sharper than a serpent’s tongue to have a thankless child…” Or, the goat parable comes to mind to most where the goat gave birth to fire and didn’t know what to do with it. Maybe, it is time to consider changing party affiliation for Ethiopian-Americans who are overwhelmingly democrats. One wonders how history will judge the President. He will definitely be remembered as the first African American President. He will definitely get the trophy for his oratory. However, the problem with this distinction is that he will also be bitterly remembered for failing to translate his oratory into action. As to his seemingly enduring legacy – Obamacare – it has a high probability of being thrown in the trash bin of history if a Republican wins the White House in 2016. So, for President Obama to have an enduring legacy, he must stand on the side of the oppressed, and the voiceless that he so much fervently spoke about; he must stand with the people of Ethiopia not with the ruthless TPLF dictators. The President’s pet projects such as ‘Power Africa’, if successful, might appease his conscience for the time being, but what he failed to achieve in the field of human rights will definitely come back later to haunt him. Africans expect more than pet projects from President Obama and he is running out of time. To redeem himself, Mr. Obama must come out of the shadow of the chuckling Susan Rice, Wendy Sherman, Gale Smith and their likes, the sooner the better. President Obama should always remember that he is the first US President of African origin that Africans wish to be proud of, and they expect him to do the right thing – stand for their cause not only in words but in concrete and tangible terms.